During the last wave of colonization on the Iron Coast, many nations of Men sent forth representatives to claim some small portion of the land for their parent nation. While the rich soil and fertile fields of the Coast would have gladly supported all comers, Man's propensity to make war upon his brother caused most of these petty baronial colonies to fail or, at most, barely eke out an existence. Plagued by war with each other, nearby Iskurland and Orroztalan (and even the County of Tengh on occasion), the Orphan Baronies exemplify the constant warfare of the Iron Coast perhaps better than any other place. Oddly enough, the common folk of the Orphan Baronies (who are sadly referred to as "Orphans" by the citizens of other nations who rarely can be bothered to tell the difference between any of the myriad paltry baronies of the Coast) often look to Port Scourge for leadership and, even more surprisingly, protection. Port Scourge only accidentally rises to that challenge. The largest city of the Iron Coast, Av-Arat occupies a mountainous island just off the Coast. The center of colonization and trading efforts on the Coast, nearly every ship that comes to or leaves the Coast passes through Av-Arat, particularly those on their way to Ur-Hadad or even farther-flung places. Technically a satellite of Ur-Hadad, Av-Arat broke off official fealty to the First City when the Regency of the Grand Viziers began around eighty years ago; now, Av-Arat not only claims independence, but also rulership over what it calls the "Iron Principality," which encompasses every nation of the Iron Coast. Lacking the ability to enforce such a claim, however, Av-Arat's claim to Princehood is ignored by all or, at best, recognized only in the field of mercantile activity. "Surely the Arati are princes," quipped one Iskurlandik huscarl, "princes of purse strings and peddlers." It is no secret today that, before the Dominion of Man spread to the Iron Coast, Men already thrived here. Evidence of this thriving can be found in the ruins of Temosh, a vast city of stone that lies in ruin about two days' ride from Port Scourge. No one lives today to tell the tale of why Temosh fell, but popular theories suggest that wars with other Men, the settlements around Lake Ohoteotl draining Temosh's population or a terrible encounter with some unnatural disaster such as a demon or dragon. It is widely believed that many treasures still linger in vaults deep beneath Temosh, but the ruins themselves are filled with beast men, poisonous plants and other, stranger terrors. The southern Kaasataha peoples between the Orphan Baronies and the Bay of Sirens regard Fallen Temosh as a lost homeland and some tribes make seasonal assaults on her, attempting to reclaim the treasure and prestige they lost when fleeing her. Ubarad and Urlansk were originally Siccalian outposts settled in an attempt to create a path from the Coast to the resource-rich mountains of the interior. The first of the two to be settled was Ubarad, on the eastern border of a vast swampland, and Urlansk was unwisely settled on one of the few patches of solid land in that selfsame marsh. 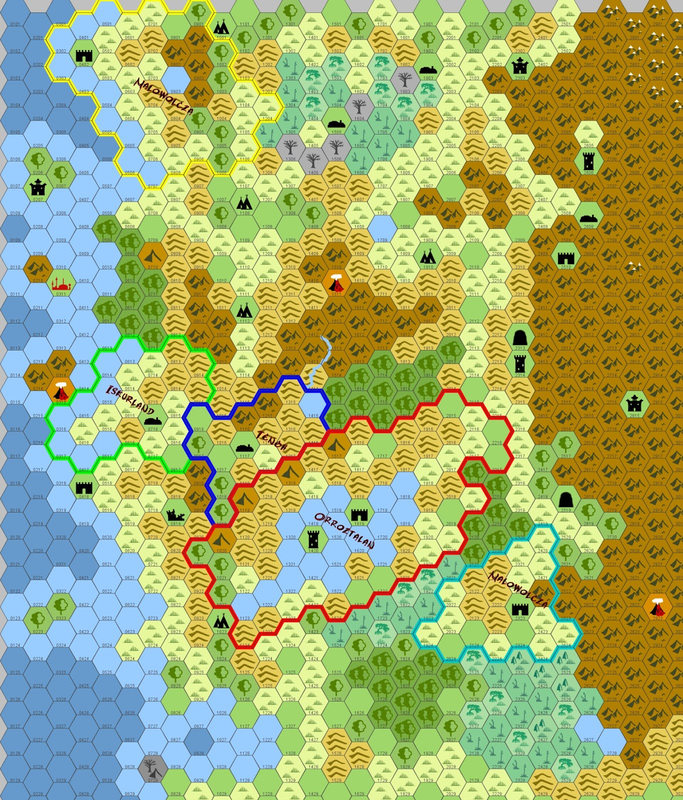 Today, the swamp keeps Urlansk largely isolated; though occasional mercantile ventures there prove wildly lucrative, the native beasts and beast men of the swamp make the travel exceptionally dangerous. Ubarad is a much safer place, though the citizens of the town feel ill at ease, suggesting that some sinister influence has come over their sister town, an influence indicated by growing trends of degeneracy found in their neighbors. Several temple-fortresses dot the landscape of the Iron Coast as well. Not two days' ride from Ubarad, the temple-fortress of Jhulvahrod keeps the tenets of the god Vahri, he who is both creator and destroyer, life and death. 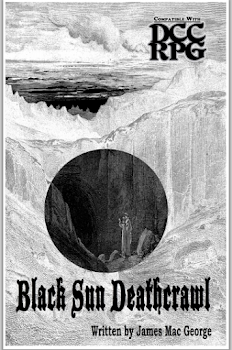 Deep in the same mountains that Jhulvahrod sits at the foot of, the Blood Pit of Gorus Na'al, where barbarous men and wild beast men come to venerate the Master of Violence. Finally, the priesthoods of two gods, Odosk the Father of Contemplation and Marhisan the Righteous Sister, have constructed an island abbey just to the southwest of Siccalia, where gentle monks of Odosk raise their flocks and the bladedancers of Marhisan defend them. Both priesthoods actively send missionaries throughout the Coast (particularly to the Orphan Baronies) to defend the defenseless and heal the wounds of war.